1. I SLEEP from the very beginning of a little one's potty training journey, it is important to be consistent. With extra absorbency for increased protection; they ensure your little one stays dry during the night without having to revert back to nappies. 2. I DO unlike nappies, the soft stretchy sides help toddlers practice pulling them up and down, just like real undies. 3. I SEE unique Disney designs that toddlers love to wear also fade when wet encouraging them to stay dry. 4. HUGGIES Pull-Ups potty training pants are also available in a Day-Time variant. The special blue learning layers allows toddlers to feel wetness for a few moments, before quickly drawing the moisture away. That way they learn wet and dry and can ultimately stay dry on their own. 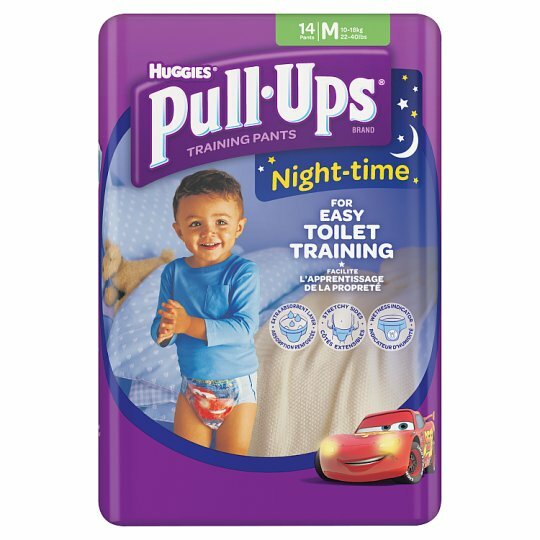 Huggies Pull-Ups potty training pants are also available in Large (16-23kg, 35-50lbs) in both a Day-time and Night-time range.